Daisy repeatedly pawed at Clair Guest's chest. This behavior towards her owner was totally out of character. "I felt the tender area where she'd pushed me, and over the next few days I detected the tiniest lump." Although the lump turned out to be a harmless cyst, "further in the breast tissue was a deep-seated cancer." The incident provides more proof of what many experts have known for a while: Dogs have the ability to sniff out cancers – and this fact can be a lifesaver. . .
Today's Scoreboard Mall Deals Featuring Spartan Race, Walmart, and Auto Parts Warehouse! Shop Rollbacks on Vacuums and Floor Care at Walmart.com! Shop Rollbacks on Kitchen Appliances at Walmart.com! Shop Dining and Entertainment Essentials on Rollback at Walmart.com! Shop Home Furnishings on Rollback at Walmart.com! [Auto Parts Warehouse] 4th of July - $10 OFF $100. Coupon Code: JUL4THAFF8 Validity: July 2 - 8, 2015. Up to $200 Off + FREE 1TB Upgrade On Budget-Friendly Windows 8.1 Laptops. Starting at $349.99. Offer Ends 7/6/15. 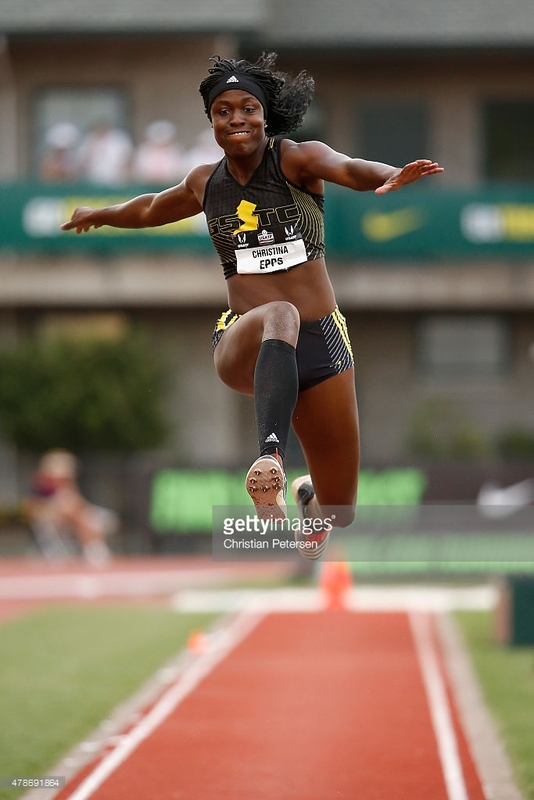 EUGENE, Ore. – Coppin State's Christina Epps, a 2014 graduate, is a national champion. A confident and consistent Epps treated the overflow crowd to an enthralling performance by soaring a career best 14.09 meters (46 feet, 2.75 inches) to win the triple jump at the USATF Outdoor Track & Field Championships at the University of Oregon’s Hayward Field Friday night. Epps is the best triple jumper in the United States of America. How amazing is that? Epps, who competes for the adidas Garden State Track Club, hit her 46-2 3/4 mark on her first attempt and it stood up as the best performance of the competition. April Sinkler was second in the TJ with a 45-4 1/2. With her victory, Epps moved one step closer to earning a sacred spot on the 2015 IAAF World Championships team set for August 22-30 in Beijing, China. She needs to clear 14.20 meters in order to officially earn a trip to China. Fortunately for Epps, her performance on Friday earned her another opportunity to reach that destination. 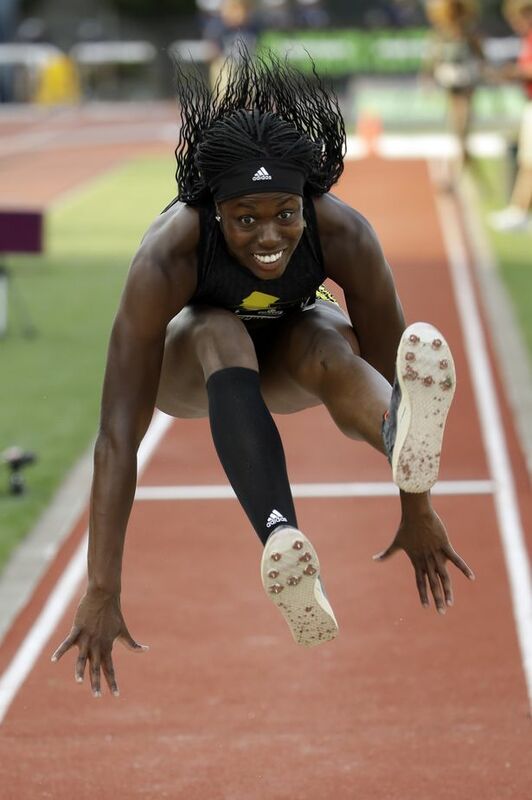 Epps will compete in the 2015 Pan-American games in Toronto next month. The triple jump will be held onTuesday, July 21 at 6:00 p.m. according to the schedule. For Epps, this was the ultimate triumph in an amazing and excellent career. Earlier this year, Epps won the triple jump at the Penn Relays and the Morgan State Legacy Meet. She jumped her previous career best of 13.83 meters at the Legacy Meet. Epps credited the energy and enthusiasm of the large crowd for providing the necessary fuel for her best performance of her life. Epps was named the Mid-Eastern Athletic Conference (MEAC) Woman of the Year and one of the 30 finalists for the 2014 NCAA Woman of the Year Award. During her star-studded career, Epps was an 12-time All-MEAC student-athlete in track and field and a six-time triple jump champion in the conference. She is the current Coppin State triple jump record holder. Her school standard is 13.40 meters (43 feet, 11.75 inches). Epps was selected as the Coppin State Female Presidents' Eagle Award Winner, Female Athlete of the Year and MVP in track and field for the 2013-14 season. She served as team captain from 2012-2014 and was the SAAC President from 2013-2014. While Epps put in hours of countless work in all types of weather conditions, made sacrifices and pushed her body beyond limits she didn’t think was possible, she knows that the support of plenty of people behind the scenes made this moment possible. “First and foremost, I would like to thank my lord and savior Jesus Christ,” Epps said. “Without him I would have none of this. My supporting cast has been amazing. My coach (Alecia Shields-Gadson) who pushed me to the next level mainly by being my sport psychologist and getting me to believe in myself like she believed in me has been nothing but a huge blessing. She is a huge part of my success and I wouldn’t trade her for anything in the world. She’s the coach of the year in my book. “My mom Beverly Epps-Blackwell is a God-fearing woman who always instilled in me to put God first and your blessings will overflow. Her constant support and prayers and support has made this process worthwhile. My weight room and plyo coaches Nick and Toya pushed me everyday even when I complained about my how my body was hurting and I didn’t want to go anymore. They have helped improve my strength and overall explosiveness in ways you wouldn’t believe especially after an ACL tear. I am extremely grateful to have them. Shields-Gadson was happy to witness Epps take her performance to another level. It was discovered in 1939 in the roots of white hellebore, a poisonous Japanese plant. A scientist named Michio Takaoka collected it from the Hokkaido Island of Japan and used crystallization to isolate what later became known as resveratrol. After that, the substance went unnoticed for over 30 years. Then modern scientists began investigating resveratrol in earnest as a potential medicine. This came after it was discovered that grape vines produce resveratrol as a response to fungal infection. First seen as a heart supplement, research has gone on to show resveratrol may also stop new cancer cells from forming—and could potentially kill a variety of existing cancer cells, too. Today I want to share exciting new findings that suggest all of us could benefit from taking it. 2014 New Year's Eve Service with Kenneth Copeland: "Bringing in 2015"
Tattoos used to be trendy mostly with certain groups – like bikers, rebels, rockers, and sailors. But these days they’ve become thoroughly mainstream. Approximately one in five adults in the US now have them, and the statistics are similar in the UK. Lately, some researchers are beginning to ask whether tattoos are safe… not only with regard to hygiene and the potential for tattoo needles to spread infections, but because little is really known about their potential for causing serious health problems — including cancer. Read on for more. . .
We’re all victims of health lies. These lies, which many people believe with a cult-like zeal, are killing us. What you’re about to read definitely flies in the face of conventional wisdom. 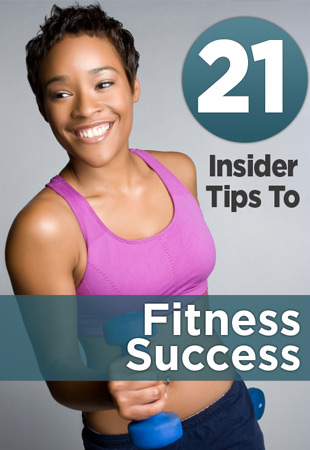 But stick with me, because this could be the missing piece of the health puzzle you’ve been trying to figure out. 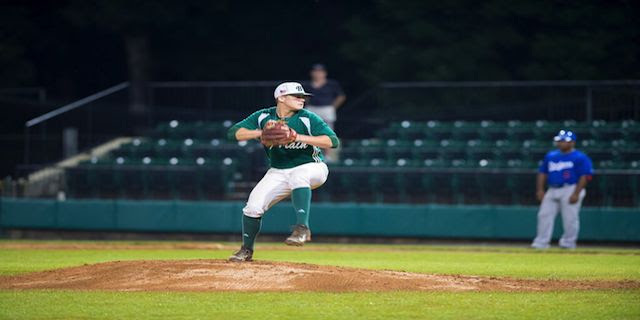 The Bethesda Big Train obliterated the Baltimore Dodgers 14-3 Wednesday night at Povich Field for their fourth straight win. The Big Train improved to 11-2 on the season and extended their lead in the South division to 4.5 games. Today's Scoreboard Mall Deals Featuring Hotwire! Share your best travel photo for a chance to WIN a 3 Night stay for two at Terrana Resort in Los Angeles, Ca!! Conest runs 6/22-7/6. DIRECTV presents the Big Time Savings Event! Save now with plans starting as low as $19.99! Tonight's game has been postponed, due to weather. I hope to see you tomorrow, Friday, June 19, as the Rockville Express come to Alexandria to take on the Aces, at 7:00 pm, at Frank Mann Field. Today's Scoreboard Mall Deals Featuring Walmart Baby Gear! Save on Baby Gear with Rollbacks at Walmart.com! Up to 60% off Clearance when you use your 20% off promo code: 20LNKC15. Valid 6/23-7/27. ACES HOME GAME, TONIGHT - 7:00 pm - Frank Mann Field (https://goo.gl/maps/1cN5G) in Alexandria! Please click the link, below, for more info! I look forward to seeing you at the ball park, tonight! AT&T Park Stadium Sprint, July 18, 2015, Sign Up Now for this Reebok Spartan Race! Pac West Sprint, August 8, 2015, Sign Up Now for this Reebok Spartan Race! Virginia Super, August 22, 2015, Sign Up Now for this Reebok Spartan Race! Chicago Super Sprint, August 15, 2015, Sign Up Now for this Reebok Spartan Race! Pennsylvania Super Sprint, July 11, 2015, Sign Up Now for this Reebok Spartan Race! Pennsylvania Sprint #2, July 18, 2015, Sign Up Now for this Reebok Spartan Race! Asheville Super, August 29, 2015, Sign Up Now for this Reebok Spartan Race! Washington D.C. Sprint, August 1, 2015, Sign Up Now for this Reebok Spartan Race! End of Spring Blowout! Up to $250 Intant Savings + 8GB Memory Upgrade on select Customizable Style & Value Laptops starting at $349.99. Offer Ends 6/22/15. Shop Rollbacks on Mattresses at Walmart.com! Shop Rollbacks on Kitchen & Dining Room Essentials at Walmart.com! Shop Kids' Furniture for Less at Walmart.com! Breaking News! Reebok Spartan Race In D.C.! What are you aware of? Who Is This Jesus Character? Be Happy! There Is Always A Next Level.